New radial line designed for telescopic handlers, backhoes and compact loaders. Versatile in several applications, TH400 is able to operate on the toughest soils while coping with the most demanding conditions. The new Trelleborg range provides your machine with high stability even when the boom is fully extended to handle heavy loads. TH400 upgrades the safety standards of your machine while extending the efficiency of your operations. The advanced TH400 radial carcass along with the reinforced structure ensure the maximum machine stability even on tough slopes permitting great manoeuvrability and comfort. The TH400 design results in a reduction of lateral deformation of more than 20%. The innovative TH400 tread pattern has been engineered and designed to maximize abrasion and wear resistance, boosting the overall strength and mileage of the tyre, even on the toughest soils whilst handling heavy loads. The shoulder and the lug shapes lead to high traction capacity during farming applications even on muddy and soft soils. 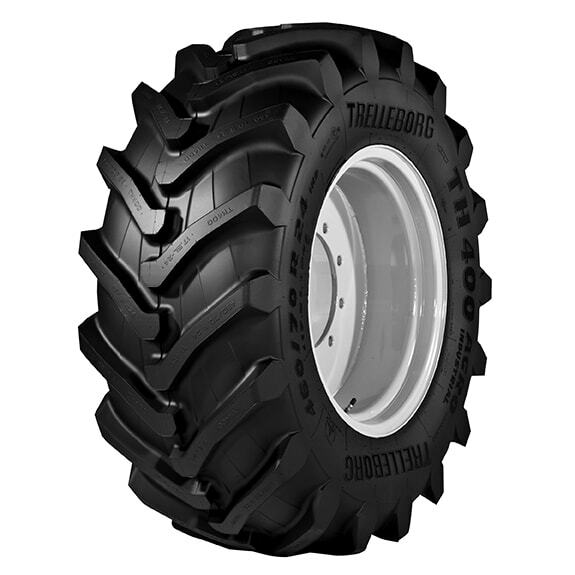 The unique Trelleborg design at the base of the lug enhances the self-cleaning performance of the tire. TH400 excels in rolling resistance performance with consequent low fuel consumption and emissions, increasing your operation profitability while respecting the environment. 50/40/35/30/25: use on the road up to a max speed of 50/40/35/30/25 km/h. 10 Cyc: Max speed 10 km/h with cyclic load. Stat: Static load at 0 km/h. For High Torque application refer to 30.